Sanctuary in the Heart of South Beach Crowne Plaza Z Ocean Hotel South Beach is an exclusive, all-suite boutique hotel located on Miami Beach's famed Ocean Drive and just steps from the Atlantic Ocean. As one of the best hotels in Miami, we offer our guests an intimate retreat from busy South Beach along with a location within walking distance of the area's premier entertainment. Our South Beach luxury hotel's lavishly appointed suites on four floors are unmatched. A myriad of gold tones glow throughout each suite, enhanced by sunlight streaming through floor-to-ceiling glass balcony doors. Jerusalem marble floors and rich mahogany furnishings balance the radiant tones in each suite. Our luxury hotel in Miami is the ultimate couples retreat with plush king-size beds dressed in luxury linens and overstuffed pillows for an experience like no other. The Rooftop Terrace Suites feature expanded interiors, spacious terraces and exciting views. A spiral staircase leads to your personal rooftop lounge, enclosed by lush landscaping and complete with a four-person roman tub, wet bar, dining and lounge areas, and a surround sound system with iPod dock. 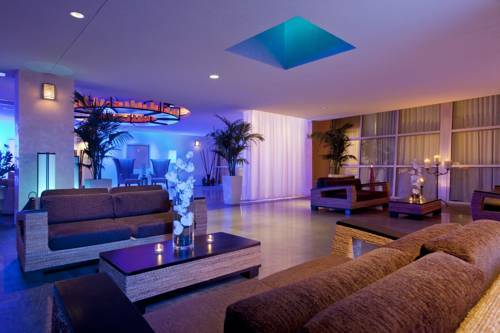 A stay at Crowne Plaza Z Ocean Hotel South Beach, is nothing short of extravagant. You'll discover a haven to relax, renew and rejuvenate your spirit and body. Discover the best South Beach luxury hotel in Miami. Breezeway Bar: Breezeway Bar located facing Ocean Drive. Relax with cocktails or food from our bar menu with 6 LED TV'S and the best views for people watching. Childrens's program - Hotel can arrange for outside Nanny services via bonded and insured company at an extra fee. Also there is a childrens playground two blocks from hotel on Lumus Park with playsets for infants to pre-teens. South BeachRaised boardwalk over the dunes popular for strolling and jogging. Proximity to sidewalk cafes along Collins Ave. Lifeguard towers, food/drink concessions, beach chair/umbrella rentals. Parking fee. Art Deco DistrictMiami Art Deco is dedicated to protecting the buildings that best represent Miami's classic architecture. Tours explore the Art Deco District including the Underworld Tour that will take you to former hotspots of illegal activity like Al Capones office! Miami Beach NightclubsMiami dance clubs and lounges open their doors to warm ocean breezes and the beautiful people who fill their dance floors and VIP rooms to capacity every night. From beach bars to trendy night clubs the Z Ocean is just steps from Miami's hottest venues..
American Airlines ArenaAmericanAirlines Arena is the top Miami event and entertainment venue, offering sports, concerts, art and theater events. Adrienne Arsht Center for Performing ArtsThe Adrienne Arsht Center for the Performing Arts serves as a showcase for the finest in established and developing cultural programs. The Arsht Center serves as a showcase, providing first class facilities for all organizations. Bass Museum of ArtThis was Miamis first public building with an exhibition space for fine arts; it was designed to preserve the symmetry of the formal gardens of Collins Park. Now, it is the centerpiece of the citys historic district and placed on the National Register. Wolfsonian MuseumThe Wolfsonian:FIU is a museum located in the heart of historic Miami Beach, it contains a fascinating collection of objects from the modern era 1885-1945 focuses on how art and design shape and reflect the human experience. Bayside MarktetplaceIndulge yourself at Bayside - great food, fun, and shopping. The shops include a large marketplace, exotic restaurants, daily live entertainment or national brand name stores. Miami Beach Golf ClubMiami Beach Golf Club is Art Deco Golf by Arthur Hills in the heart of the pulsing South Beach action and only blocks from the beach. This course is a wonderful venue for all golf aficionados.